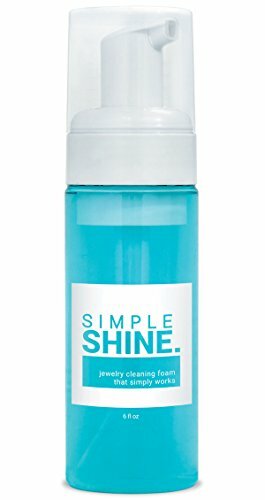 Forget the cheap, abrasive, harsh drip solutions and try Simple Shine jewelry cleaning foam today! The foaming bubbles go to work to break down years of build up tarnish or simple daily dirt with our AMMONIA FREE foamer formula that works on gold, palladium, platinum, sterling silver, stainless steel, titanium, diamonds, CZ, pearls, beads, porous stones, soft stones, enamel, treated gemstones, pearl, opal, emerald, turquoise, amber, coral and onyx. Tough on dirt but gentle on your jewelry and yourself. Jeweler recommended as a favorite diamond ring cleaner and gold jewelry cleaner. The key difference between our product and cheaper solutions is that our cleaner WORKS while still being NON-TOXIC and SOCIALLY RESPONSIBLE. See why others are calling us the best seller jewelry cleaner on the market. Want to clean your jewelry and feel good about it? Try Simple Shine today and see why there is a difference! PREMIUM FORMULA, ETHICALLY PRODUCED, MADE IN THE USA. To use, remove cap and place on a level surface. Gently place jewelry inside cap. Holding bottle 2 inches away, dispense 6 pumps of Simple Shine foaming cleaning solution into the cap, covering jewelry thoroughly. Let jewelry soak until foam has dissolved. Remove jewelry from cap, rinse with cool water. Blot jewelry dry. UNIVERSAL CLEANING FOAM: Our foaming jewelry solution gently yet effectively cleans fine and fashion jewelry made from a wide variety of materials. It is formulated to safely clean gold, palladium, platinum, sterling silver, stainless steel, titanium, diamonds, CZ, pearls, beads, porous stones, soft stones, enamel, treated gemstones and more. It is sure to become your go-to jewelry cleaner! DISPENSES NEW SOLUTION EACH USE: Achieve an fresh clean using pure, new solution dispensed each time, unlike the re-used dip solution cleaners. Simply dispense the foamer solution from the pump and allow the foaming bubbles to slowly break down grime and dirt as it dissipates. Follow with a quick rinse in water and blot dry to reveal sparkling, clean jewelry. 100% NON-TOXIC & BIODEGRADABLE: Our solution contains absolutely NO AMMONIA or harsh chemicals. It is specially formulated to deep clean without abrasive chemicals. Our foaming jewelry solution is safe for you, your jewelry and the planet! Perfect for your delicate jewelry pieces with a 100% MONEY BACK GUARANTEE. 100% SATISFACTION GUARANTEE: Try our jewelry cleaner for yourself & then decide. If you don't love our foaming jewelry cleaner, let us know and receive a full, no questions asked refund. We are a small family owned business that stands by your happiness! EXCEPTIONAL QUALITY & SOCIALLY RESPONSIBLE: We use premium ingredients not found in other lesser quality discount solutions. Do not be fooled by cheap alternatives! Our jewelry cleaning solution is made to strict, tested, trade-secret standards. We are committed to local sourcing and 100% of our suppliers are based in the United States. Our packaging has been specifically designed to reduce plastics and utilize recycled material where possible. Our solution is local and socially responsible.